The most successful movie franchise of all time is the “Harry Potter” series, which recently edged out another famous Brit: James Bond. According to Box Office Mojo, the first six adaptations of J.K. Rowling’s beloved books have earned a staggering $5.4 billion worldwide, not adjusted for inflation. The 22 films considered part of the official Bond canon (the 1967 spoof “Casino Royale” and the 1983 out-of-continuity “Never Say Never Again” don’t count) have earned an estimated $5 billion globally. But even if the earnings of those two films were included, it still wouldn’t be enough to put 007 on top. But the box-office receipts may not tell the whole story. When other sources of money such as merchandising are included, then George Lucas’ Star Wars universe of Jedi, droids and Wookiees is Hollywood’s highest-grossing franchise. In 2005, Forbes estimated the Star Wars Empire had grossed $20 billion from movie tickets, books, games and anything else you could possibly license. Still, Bond is certainly Hollywood’s greatest franchise in terms of endurance and longevity. Since the first Bond adventure, “Dr. No” in 1962, it has thrived for 48 years, although the 23rd Bond picture is reportedly on hold for now. 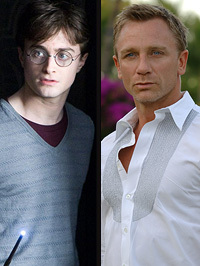 Bond may need to stick around awhile to have any chance of overtaking Potter. The last of Rowling’s books, “The Deathly Hallows,” is being adapted into two films, the first of which is scheduled to arrive in November 2010. With millions of people still captivated by the Harry Potter phenomenon, the film series may pad its lead as the worldwide box-office leader. It’s important to note these dollar amounts are not adjusted for inflation; otherwise, the Bond series and Star Wars would be well ahead of the boy wizard in terms of global box office earnings. Meanwhile, Director James Cameron is reportedly working on two “Avatar” sequels…..